On a blustery morning in May, a flood of Baltimore students excitedly pours out of a school bus at the city’s Inner Harbor. They’re not here for a field trip to the zoo or aquarium—these kids are here to learn about trash. 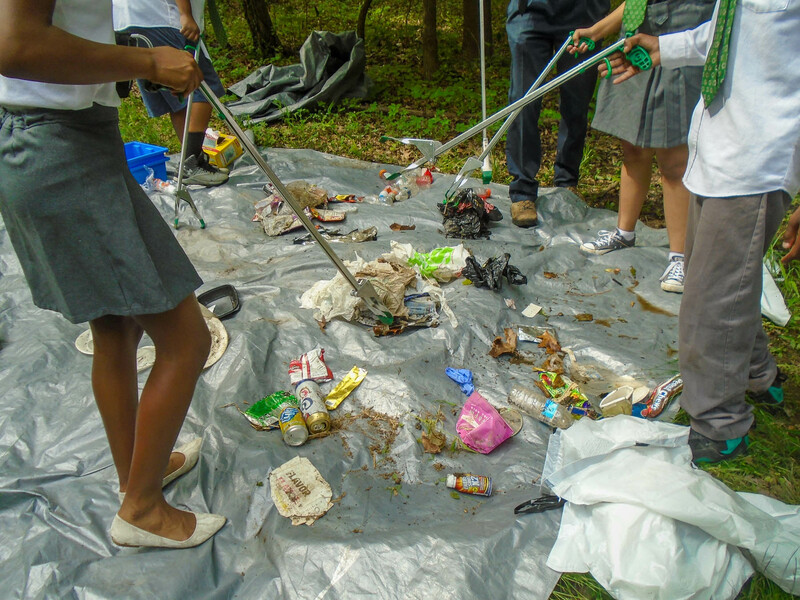 Michael Sarbanes’ seventh grade class has spent several weeks immersed in a project where each was given a camera to document a subject that hits close to their Baltimore home: trash. Litter is such a part of the landscape in the busy metropolis that many residents cease to register its presence. Floating down the streets, disintegrating over storm drains and peppering the sidewalks with colored flashes of cellophane, litter is simply there, ever present. 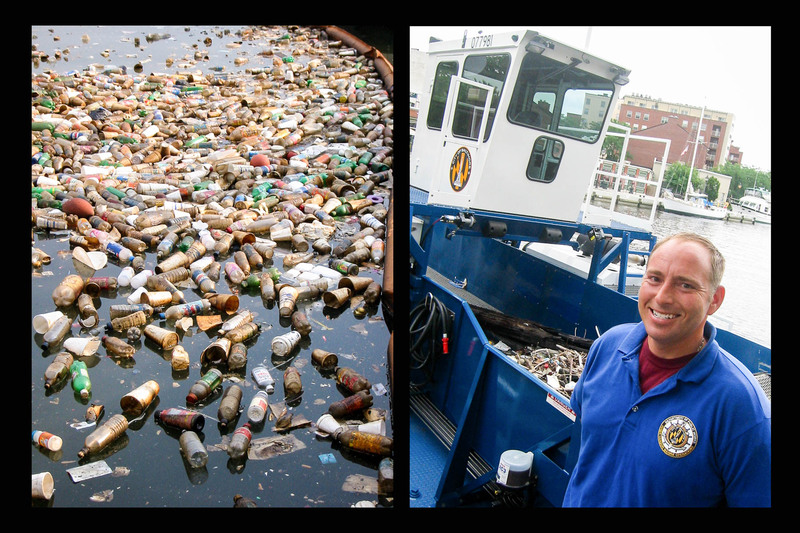 A man who knows a great deal about the constant presence of trash is Public Works Department employee and Baltimore native, Jason Szymanski. He spends his days out on the water, seeing the disregard of the Bay firsthand as he operates the trash skimmer. Standing at the water’s edge and addressing the kids, he explains the trouble with plastics, Styrofoam, old clothing and general debris that contaminate the water and make it unfit for humans to swim. Most creatures cannot thrive in the impenetrable, chocolate-tinged dirty harbor water. Many students nod along in agreement as Szymanski talks. Sarbanes’ class attends Green Street Academy, a public charter school in west Baltimore. 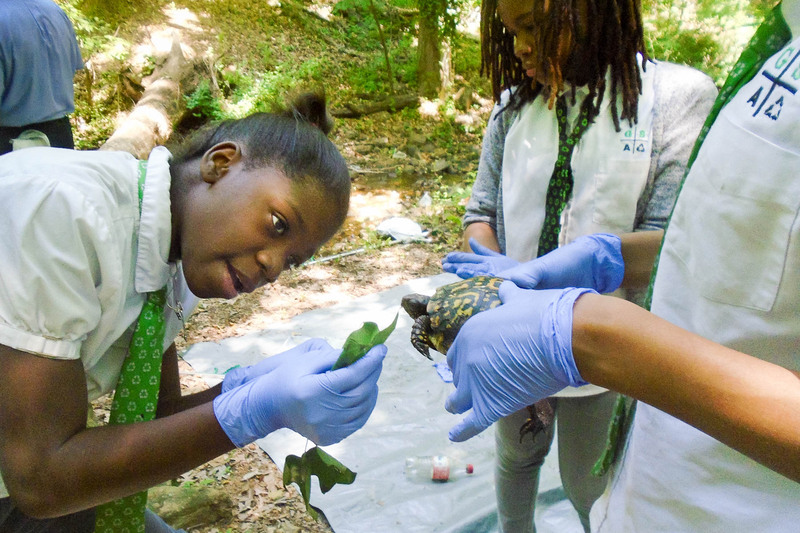 In 2017, Green Street Academy teamed up with the U.S. Forest Service on a science-based curriculum, “From Street to Stream to Harbor,” to explore the ways that our waterways are connected. 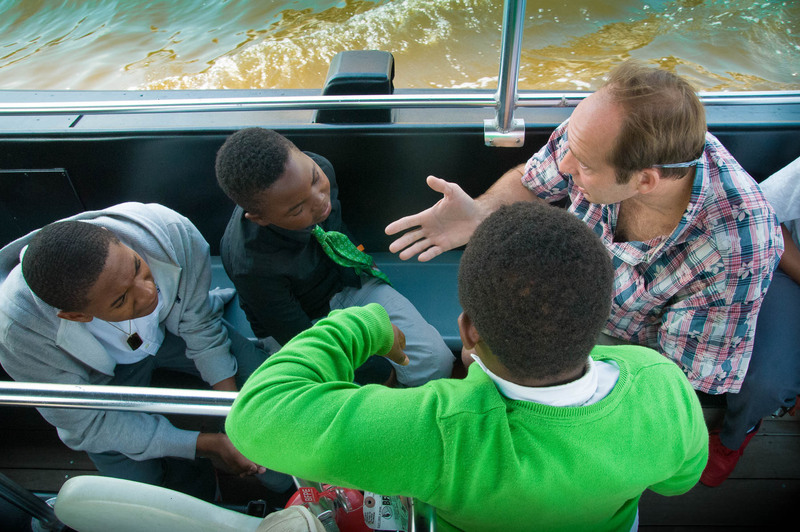 The program armed each student in the class with a camera to snap images as they did stream cleanups, studied how trees and green spaces help clean stormwater, learned the impact of trash on ecosystems, and joined in a boat trip to see firsthand how trash impacts the ecosystem. 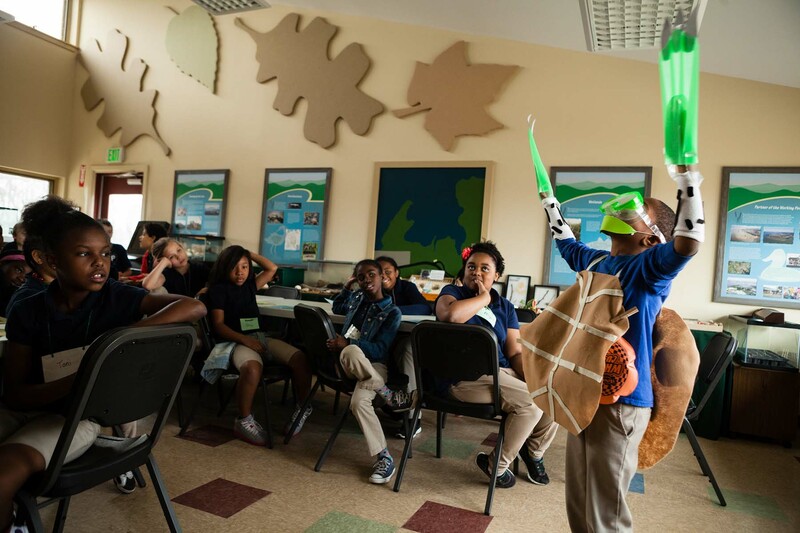 “[The kids] take a lot of pride in this school,” says Quintaniay Holifield, a passionate Street to Stream representative and soil scientist for the Forest Service. She and Sarbanes grin at each other as together they explain some of the previous lessons in the ongoing project, including a cleanup of the stream behind the school, a small portion of the Gwynns Falls tributary. The whole class enthusiastically jumped in to clean up, but the return to pristine conditions was short-lived. Sarbanes sighs as he explains that two days later, the trash was back. “I was like—‘What?’” It’s Chris, a spunky student whose pluck made his presence seem larger than his physical size, and who had been listening to the adults. The stream cleanup had taken hours, but after a run-of-the-mill April rain, the stream looked just as it had before. When it rains, the resulting stormwater carries with it whatever is on the land as it travels, transporting not only water but dirt and trash into our waterways. It is for this reason that trash cleanups are not enough to reduce pollution. Pollution reduction starts with us, our behavior and how we see our impact on the world. While the adults reflected on this sobering fact, Chris turns the conversation to the more important points. “We found a frog!” he announces. The topics of trash in the environment and the health of the water are often treated as separate issues, yet they are closely connected. 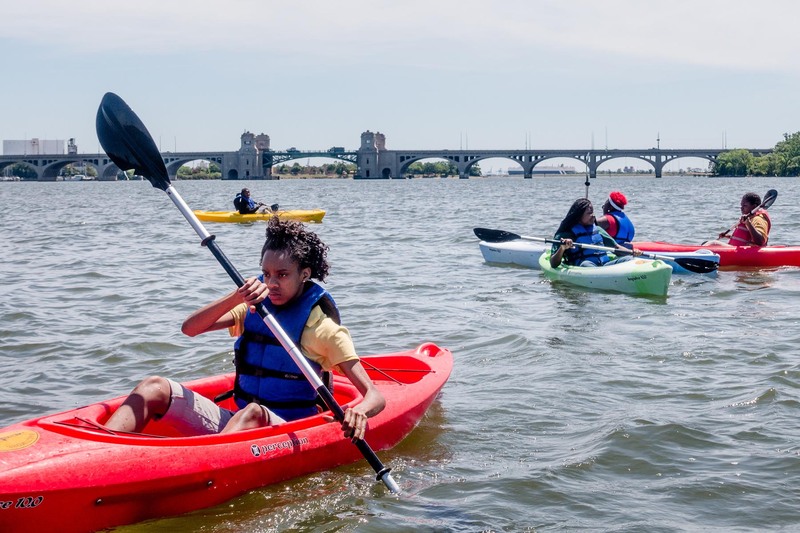 Many of the children who live in Baltimore have never been on the open water and were very wary of boarding the boat—but the trip on the water is a key piece of the trash story in the city of Baltimore, as everyone sees the devastating effect of the trash and pollutants in the harbor. Building an ethic of sustainability starts with creating a sense of place. The kids are soon lost in the wonder of nature, taking pictures of one another and asking rapid-fire questions of their science teacher, particularly when a large bird came up with a huge fish, swallowing and eating it right in front of the children. “Did you see that fish!” echoes from several sections of the boat, more an exclamation and announcement than a question to any one person in particular. The students closest to the water gaped back, all fear of the boat forgotten. Kenyon, a quiet boy with his arms back on the railing in his lime green sweater, looks back and forth across the view. “I want to drive a boat,” he says decidedly. The boat takes them past dwellings, warehouses, beautiful paths and empty buildings of Baltimore, making a turn at the trash wheel. Baltimore now has two googly-eyed water wheels to help dispose of water refuse, named Mr. Trash Wheel and Professor Trash Wheel Since May of 2014, the trash wheels have collected 1,510,800 pounds of trash. To put that in perspective, that is the weight of about 60 school buses, yet it is 1.5 million pounds made up of items that seem light and insignificant on their own: Styrofoam cups, chip bags, cigarette butts and tiny pieces of plastic. These students are beginning to help people take notice. One of the photos from their lesson is featured in the Baltimore City Department of Public Works 2018 calendar, mailed to thousands of residents. 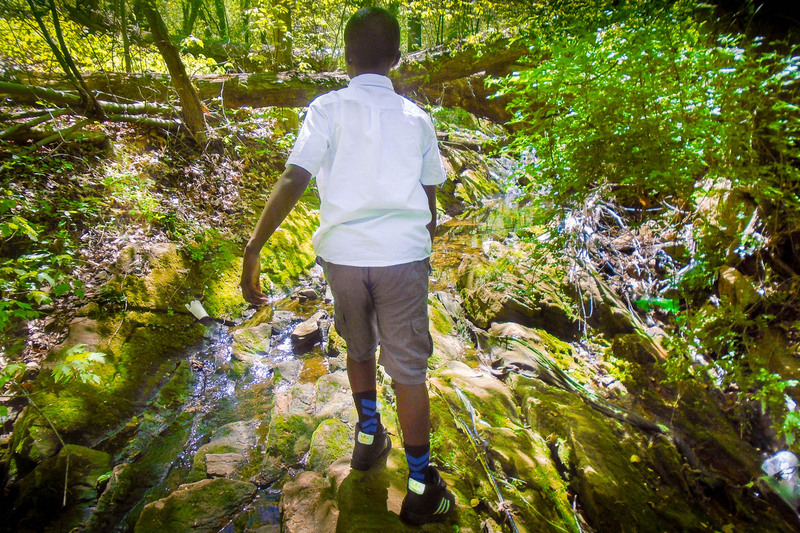 The photos they took throughout their project were unveiled during Baltimore City’s Core Values Night in November and are now featured in a traveling photo gallery that brings awareness to the issue of litter and the benefits of green spaces. The city of Baltimore is currently considering a vote to implement a ban on polystyrene, the material used in Styrofoam, clogging up landfills. The students of Green Street Academy, their teachers, the Forest Service and all those involved in the Street to Stream endeavor hope first to change the idea of trash as a normal part of the landscape—getting residents to start seeing, again, the trash that floods the streets.